Related to this is the ideal of the recluse influencing society for the better, whether or not he was eventually recognized and called back by worthy rulers, an ideal also expressed in ancient times. For an example of this ideal see Seeking Seclusion. Shanju Yin was a very popular title, surviving in 46 handbooks to 1894.4 In spite of the variety within these versions, most attributions are to one person, the well-known late Song dynasty Hangzhou qin master Mao Minzhong (here: Mao Zhongweng).5 When the Yuan forces overran Hangzhou Mao is said to have withdrawn into the mountains and remained separate from society; another account, however, has him going to the Yuan capital to play Yu Hui Tushan. In addition to my recordings of the two earliest versions, there have also been silk string recordings of Shanju Yin by Liu Shaochun (Guangling style) and Wang Duo (from 1525).7 Other recordings use metal strings and tend to follow the version played by Liu Shaochun. However, although their program notes generally mention only the Shen Qi Mi Pu version, clearly all are based on a very different later handbook or handbooks. All are thus very different from the present version, though a musical relationship can still be heard (or found through a transcription). Zheyin Shizi Qinpu also adds lyrics and sub-titles to each section. this piece was written by Mao Zhongweng of the Song dynasty. Its theme lies in being a gentleman nesting in clouds or pine trees among the hills and valleys. Lacking desires, he and society have forgotten each other, and he does not drag worldly entrapments to himself, but in fact uses mountains as a barricade and clean flowing water as a (protective) moat. Heaven and earth form his hut, grass and trees comprise his clothing; he pillows his head on rocks in a stream, and rinses out his mouth with stones from the river; he happily goes back and forth amongst all this. As for the pleasure of moon in the mountains, wind on the river, or the sound of birds crying and flowers falling, the taking of all these things is not forbidden: they can be used, but never used up. This is what is called a person who loves whatever nature has fated him with, because nature has already given him so much. And if someone is happy to live until old age amongst springs and rocks, he will get even more pleasure. None of these seems particularly relevant to the theme here. 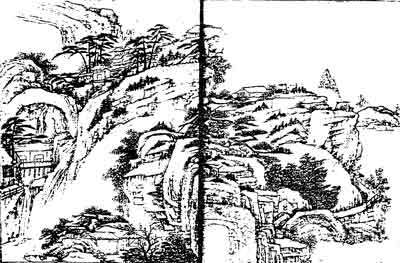 The earliest relevant references in ZWDCD seem to be to the Rhapsodies on Mountain Life (8043.221 山居賦 Shan Ju Fu: 文章偏名。南朝宋謝靈運選) by Xie Lingyun. Xie Lingyun (Wade-Giles Hsieh Ling-yün), known as the first great Chinese nature poet or (more literally) "rivers and mountains poet", is still honored today for his poetry on the joys of nature. The reference for comments above is to the translation of his poems by David Hinton, The Mountain Poems of Hsieh Ling-yün, New Directions, 2001. (Hinton uses Wade-Giles, changed here to fit with the rest of the page). Xie's poetry is also translated in J. D. Frodsham, The Murmuring Stream: The Life and Works of the Chinese Nature Poet Hsieh Ling-yun (385–433), Duke of K’ang-Lo. Kuala Lumpur: University of Malaya Press, 1967. For further information on zhi mode see Shenpin Zhi Yi and Modality in Early Ming Qin Tablature. The chart below, based largely on Zha Guide 6/58/86, lists 49 surviving versions in 46 handbooks (1663-5 and 1670 have multiple versions). See the silk string contents. There are also a number of metal string recordings by Mei Yueqiang, Gong Yi and others. I have not seen yet their source. For the original text see 山居吟. 1. 伴泉石 ; 2. 廬天地 ; 3. 臥姻霞 ; 4. 友風雨 . Further comment above; based mainly on Zha Fuxi's Guide, 6/58/86. No afterword, suggesting it was considered a prelude for Qiao Ge, using the latter's afterword as its own. (1573; #51) Same as 1585? (1614; VIII/138) 1 section: the multiple sections of earlier versions seem combined into 1; "徵"
(1722; XIV/510) 3; 徵音; attributed to "毛子 Master Mao"
(1868; XXVI/71) 3; 商音; attrib. "毛子 Master Mao"
#1 (1876; XXV/469) 4T+1; 羽音; "1739"
#2 (1876; XXV/576) 4T+1; 蕤賓; attrib "Tang Yiming"
"常熟派，得自歐陽鳳威處 Changshu School, obtained from Ouyang Fengwei's"
(1894; XXVIII/380) 3; "黃仲調，羽音"; attrib. "毛子 Master Mao"